For other types of power, see Power. Entities other than states can also be relevant in power acquisition in international relations. Such entities can include multilateral international organizations, military alliance organizations like NATO, multinational corporations like Wal-Mart, non-governmental organizations such as the Roman Catholic Church, or other institutions such as the Hanseatic League. Power as status, which some states or actors possess and others do not. Primary usage of "power" as a goal in international relations belongs to political theorists, such as Niccolò Machiavelli and Hans Morgenthau. Especially among Classical Realist thinkers, power is an inherent goal of mankind and of states. Economic growth, military growth, cultural spread etc. can all be considered as working towards the ultimate goal of international power. The German military thinker Carl von Clausewitz is considered to be the quintessential projection of European growth across the continent. In more modern times, Claus Moser has elucidated theories centre of distribution of power in Europe after the Holocaust, and the power of universal learning as its counterpoint. Jean Monnet was a French left-wing social theorist, stimulating expansive Eurocommunism, who followed on the creator of modern European community, the diplomat and statesman Robert Schuman. NATO accounts for over 70% of global military expenditure, with the United States alone accounting for 43% of global military expenditure. Political scientists principally use "power" in terms of an actor's ability to exercise influence over other actors within the international system. This influence can be coercive, attractive, cooperative, or competitive. Mechanisms of influence can include the threat or use of force, economic interaction or pressure, diplomacy, and cultural exchange. Under certain circumstances, states can organize a sphere of influence or a bloc within which they exercise predominant influence. Historical examples include the spheres of influence recognized under the Concert of Europe, or the recognition of spheres during the Cold War following the Yalta Conference. The Warsaw Pact, the "Free World", and the Non-Aligned Movement were the blocs that arose out of the Cold War contest. Military alliances like NATO and the Warsaw Pact are another forum through which influence is exercised. However, "realist" theory attempted to maintain the balance of power from the development of meaningful diplomatic relations that can create a hegemony within the region. British foreign policy, for example, dominated Europe through the Congress of Vienna after the defeat of France. They continued the balancing act with the Congress of Berlin in 1878, to appease Russia and Germany from attacking Turkey. Britain has sided against the aggressors on the European continent—i.e. 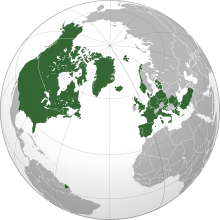 the German Empire, Nazi Germany, Napoleonic France or Habsburg Austria, known during the Great War as the Central Powers and, in the World War Two were called the Axis Powers. Power is also used when describing states or actors that have achieved military victories or security for their state in the international system. This general usage is most commonly found among the writings of historians or popular writers. For instance, a state that has achieved a string of combat victories in a military campaign against other states can be described as powerful. An actor that has succeeded in protecting its security, sovereignty, or strategic interests from repeated or significant challenge can also be described as powerful. Power is the capacity to direct the decisions and actions of others. Power derives from strength and will. Strength comes from the transformation of resources into capabilities. Will infuses objectives with resolve. Strategy marshals capabilities and brings them to bear with precision. Statecraft seeks through strategy to magnify the mass, relevance, impact, and irresistibility of power. It guides the ways the state deploys and applies its power abroad. These ways embrace the arts of war, espionage, and diplomacy. The practitioners of these three arts are the paladins of statecraft. Power is also used to describe the resources and capabilities of a state. This definition is quantitative and is most often used by geopoliticians and the military. Capabilities are thought of in tangible terms—they are measurable, weighable, quantifiable assets. A good example for this kind of measurement is the Composite Indicator on Aggregate Power, which involves 54 indicators and covers the capabilities of 44 states in Asia-Pacific from 1992 to 2012. Thomas Hobbes spoke of power as "present means to obtain some future apparent good." Hard power can be treated as a potential and is not often enforced on the international stage. "France was not strong enough to oppose Germany in a one-to-one struggle... If the mark of a Great Power is country which is willing to take on any other, then France (like Austria-Hungary) had slipped to a lower position. But that definition seemed too abstract in 1914 to a nation geared up for war, militarily stronger than ever, wealthy, and, above all, endowed with powerful allies." Superpower: In 1944, William T. R. Fox defined superpower as "great power plus great mobility of power" and identified three states, the British Empire, the Soviet Union and the United States. With the decolonisation of the British Empire following World War II, and then the disintegration of the Soviet Union in 1991, the United States is currently the only country considered to be a superpower. Great power: In historical mentions, the term great power refers to the states that have strong political, cultural and economical influence over nations around them and across the world. Middle power: A subjective description of influential second-tier states that could not quite be described as great or small powers. A middle power has sufficient strength and authority to stand on its own without the need of help from others (particularly in the realm of security) and takes diplomatic leads in regional and global affairs. Clearly not all middle powers are of equal status; some are members of forums such as the G20 and play important roles in the United Nations and other international organisations such as the WTO. Small power: The International System is for the most part made up by small powers. They are instruments of the other powers and may at times be dominated; but they cannot be ignored. Regional power: This term is used to describe a nation that exercises influence and power within a region. Being a regional power is not mutually exclusive with any of the other categories of power. The majority of them exert a strategic degree of influence as minor or secondary regional powers. A primary regional power (like Australia) has often an important role in international affairs outside of its region too. Cultural superpower: Refers to a country whose culture, arts or entertainment have worldwide appeal, significant international popularity or large influence on much of the world. Countries such as Italy, Japan, Spain, the United Kingdom, and the United States have often been described as cultural superpowers, although it is sometimes debated on which one meets such criteria. Unlike traditional forms of national power, the term cultural superpower is in reference to a nation's Soft power capabilities. Energy superpower: Describes a country that supplies large amounts of energy resources (crude oil, natural gas, coal, uranium, etc.) to a significant number of other states, and therefore has the potential to influence world markets to gain a political or economic advantage. Saudi Arabia and Russia, are generally acknowledged as the world's current energy superpowers, given their abilities to globally influence or even directly control prices to certain countries. Australia and Canada are potential energy superpowers due to their large natural resources. Some political scientists distinguish between two types of power: Hard and Soft. The former is coercive while the latter is attractive. Hard power refers to coercive tactics: the threat or use of armed forces, economic pressure or sanctions, assassination and subterfuge, or other forms of intimidation. Hard power is generally associated to the stronger of nations, as the ability to change the domestic affairs of other nations through military threats. Realists and neorealists, such as John Mearsheimer, are advocates of the use of such power for the balancing of the international system. Joseph Nye is the leading proponent and theorist of soft power. Instruments of soft power include debates on cultural values, dialogues on ideology, the attempt to influence through good example, and the appeal to commonly accepted human values. Means of exercising soft power include diplomacy, dissemination of information, analysis, propaganda, and cultural programming to achieve political ends. Others have synthesized soft and hard power, including through the field of smart power. This is often a call to use a holistic spectrum of statecraft tools, ranging from soft to hard. During the time of the Renaissance, powers in Europe included Spain, England, France, the Habsburg Empire, Poland-Lithuania and the Ottoman Empire. Bolstered by shipments of gold and silver from the Americas, the Spanish Habsburg dynasty emerged as a dominant force and regularly launched military interventions to project its power and defend Catholicism, while its rival, France, was torn apart by religious civil war. Meanwhile, in Eastern Europe, the Ottoman Empire reached its zenith and completed its conquest of the Balkan region. During the 17th century the Netherlands and Sweden were added to the group, whilst the Ottomans, Poland and Spain gradually declined in power and influence. France progressively grew stronger and by the latter part of the century found itself repeatedly facing alliances designed to hold its military power in check. In the 18th century, Great Britain (formed from a union of England and Scotland) progressively gained strength and Russia and Prussia also saw their importance increase, while Sweden and the Dutch Republic declined. Great Britain and France increasingly struggled for dominance both on the continent and abroad (notably in North America, the Caribbean and India). By the century's end, the British had established themselves as the foremost naval power while the French were dominant on land, conquering many of their neighbors during the French Revolutionary Wars and establishing client republics. The struggle between the two nations ended only in 1815 with the final defeat of the French under Napoleon. During the 19th century, there was an informal convention recognising five Great Powers in Europe: the French Empire, the British Empire, the Russian Empire, the Austrian Empire (later Austria-Hungary) and the Kingdom of Prussia (later the German Empire). In the late 19th century the newly united Italy was added to this group. ↑ "SIX PRINCIPLES OF POLITICAL REALISM". ↑ Bauer, Richard H. "Hans Delbrück (1848-1929)." Bernadotte E. Schmitt. Some Historians of Modern Europe. Chicago: University of Chicago Press, 1942. ↑ ANGELA LAMBERT (27 July 1992). "INTERVIEW / Sir Claus Moser: 73.5 per cent English: 'What is dangerous". The Independent. ↑ Anonymous (16 June 2016). "About the EU - European Union website, the official EU website - European Commission" (PDF). Retrieved 27 November 2016. ↑ "The SIPRI Military Expenditure Database". Stockholm International Peace Research Institute. Archived from the original on March 28, 2010. Retrieved 2010-08-22. ↑ "The 15 countries with the highest military expenditure in 2009". Stockholm International Peace Research Institute. Retrieved 2010-08-22. ↑ A.J.P.Taylor, "Origins of the First World War"
↑ Ensor, Sir Robert (1962) 2nd ed. "Britain 1870-1914" The Oxford History of England. ↑ Marcella, Gabriel (July 2004). "Chapter 17: National Security and the Interagency Process" (PDF). In Bartholomees, Jr., J. Boone. U.S. Army War College Guide to National Security Policy and Strategy. United States Army War College. pp. 239–260. ↑ Fels, Enrico (2017). Shifting Power in Asia-Pacific? The Rise of China, Sino-US Competition and Regional Middle Power Allegiance. Springer. p. 225-340. ISBN 978-3-319-45689-8. Retrieved 2016-11-25. ↑ Kennedy, Paul (1989) . The Rise and Fall of the Great Powers: Economic Change and Military Conflict from 1500 to 2000. London: Fontana. p. 290. ISBN 0006860524. ↑ Evans, G.; Newnham, J. (1998). Dictionary of International Relations. London: Penguin Books. p. 522. ↑ Kim Richard Nossal. Lonely Superpower or Unapologetic Hyperpower? Analyzing American Power in the post–Cold War Era. Biennial meeting, South African Political Studies Association, 29 June-2 July 1999. Retrieved 2007-02-28. ↑ Ovendale, Ritchie (January 1988). "Reviews of Books: Power in Europe? Great Britain, France, Italy and Germany in a Postwar World, 1945-1950". The English Historical Review. Oxford University Press. 103, number 406 (406): 154. doi:10.1093/ehr/CIII.CCCCVI.154. ISSN 0013-8266. ↑ Heineman, Jr., Ben W.; Heimann, Fritz (May–June 2006). "The Long War Against Corruption". Foreign Affairs. Council on Foreign Relations. Ben W. Heineman, Jr., and Fritz Heimann speak of Italy as a major country or 'player' along with Germany, France, Japan, and the United Kingdom. ↑ Roberson, B. A. (1998). Middle East and Europe: The Power Deficit. Taylor & Francis. ISBN 9780415140447. Retrieved 2013-08-11. ↑ Fels, Enrico (2017). Shifting Power in Asia-Pacific? The Rise of China, Sino-US Competition and Regional Middle Power Allegiance. Springer. p. 213. ISBN 978-3-319-45689-8. Retrieved 2016-11-25. ↑ Rudd K (2006) Making Australia a force for good, Labor eHerald Archived June 27, 2007, at the Wayback Machine. ↑ Italy has been described as a cultural superpower by Arab news, by Global Times, by the Washington Post, by The Australian. Italy has been described as a cultural superpower by the Italian consul general in San Francisco, by former minister giulio terzi and by US President Barack Obama. Archived December 26, 2014, at the Wayback Machine. ↑ "The other superpower". The Guardian. London. 2002-06-01. Retrieved 2009-07-17. ↑ "How Japan became a pop culture superpower". 31 January 2015. Retrieved 27 November 2016. ↑ "Beyond Bullfights and Sangria: Five Centuries of Spanish History through Its Music, Art, and Literature - UC San Diego Extension". Retrieved 27 November 2016. ↑ "Spain, main reference for world's Hispanic heritage". ABC.es. Madrid. 2014-07-03. Retrieved 2016-06-08. ↑ "From Seville to Brussels: The Architecture of Global Presence". International Relations and Security Network. October 28, 2015. Retrieved December 9, 2015. Our partners at the Elcano Royal Institute have released their latest edition of the Global Presence Index. It confirms that the EU – if perceived as a single global actor – has the greatest degree of ‘presence’ in the world, largely because of the contributions of the UK, Germany and France. ↑ Dugan, Emily (18 November 2012). "Britain is now most powerful nation on earth". The Independent. London. Retrieved 18 November 2012. ↑ "The cultural superpower: British cultural projection abroad" (PDF). Journal of the British Politics Society, Norway. 6 (1). Winter 2011. Retrieved 24 October 2014. ↑ "Report: Canada can be energy superpower". UPI.com. 2012-07-20. Retrieved 2013-04-30. ↑ "Australia to become energy superpower?". UPI.com. 2012-05-14. Retrieved 2013-04-30. Fels, Enrico (2017). Shifting Power in Asia-Pacific? The Rise of China, Sino-US Competition and Regional Middle Power Allegiance. Cham: Springer. ISBN 978-3-319-45689-8. Ferguson, Niall. "What is power?". Hoover Digest. Hoover Institution. Archived from the original on May 28, 2007.